Home > View All Products > Smoothie Cups - 15 lbs. Smoothie Cups - 15 lbs. 15lbs of Smoothie Cups is sure to satisfy any sweet tooth. 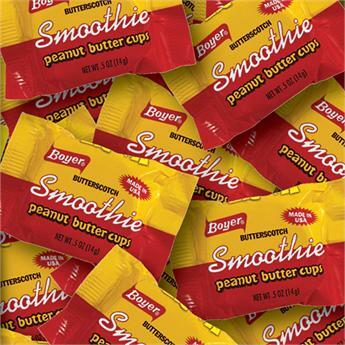 With approximately 450 Smoothie Cups in this giant bag, you’re sure to have more than enough to satisfy your desire for the world’s best candy. This retro candy is a favorite among those of all ages. Smoothie Cups combine creamy peanut butter and butterscotch to create a unique and delicious flavor combination.